Let’s say that I am a powerful fairy godmother and with a wave of my magic wand I could immediately transform all vehicles into electric powered, zero-emission wonders of the modern world. Many of our pollution issues would be solved. The air would be cleaner and everyone would be smiling in the brightness of direct and unfiltered sunshine. If there is a utopia, this would certainly be part of it. Perhaps this is the future. I can only wish. The startling reality is the wave of my magic wand would wreak havoc if, suddenly, all vehicles needed to be plugged into the electrical grid. Would Electric Vehicles Strain the Power Grid? As robust as we believe it to be, it is a fragile network. Sure it has some extra capacity, but it would crumble under the stress of the exponential demand placed upon it by everyone plugging in, especially with large fleets of electric vehicles. As a society, we’d have to decide between powering the lights in our home and charging up the car for tomorrow’s commute to the office. It will take a couple of generations to bolster the electrical grid to accommodate that type of electrical supply infrastructure. Does that mean we are stuck with having to cough and choke our way through 40 more years of fossil fuel and the nasty challenges it continues to present modern society? No it doesn’t. That’s because there are alternative fuels and transportation technologies that will help ease us into the carbon-free future. Hydrogen is one of those emissions-free alternative fuels that can be transformational in our quest for zero tailpipe emissions. Although in its market infancy as a transportation fuel, government agencies and the transit industry are working towards clean, economical, and safe hydrogen production and distribution. Most likely, it will be used in fuel cell-powered equipment. Fuel cell electric vehicles are beginning to enter the consumer market in localized regions around the world. The fuel cell power system is also developing for passenger vehicles, transit buses, light rail, and a range of other medium- and heavy-duty vehicle applications. Hydrogen is the most abundant chemical substance in the universe. It can be generated from low carbon sources outside of the city and distributed in the same way as fossil fuels are today. The refuelling protocols are in place for “at the pump” applications. 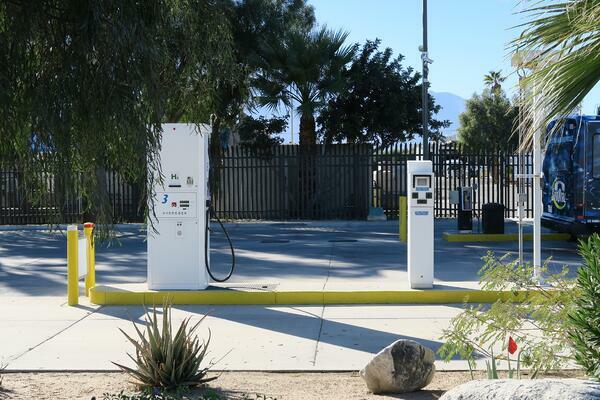 As for public transit or fleet applications, the installation of a hydrogen fueling system to replace the existing fossil fuel depot is well established and documented. It is very similar to CNG infrastructures which are already deployed in large scale depots at many transit agencies. It’s almost plug and play. The refuelling times are similar to those of diesel-powered transportation and they are proven to be as safe. Fun Fact*: A fuel cell coupled with an electric motor is two to three times more efficient than an internal combustion engine running on gasoline. For transit agencies, there are definite advantages that hydrogen fueling infrastructure presents over battery-charging infrastructure, especially for battery electric buses including its scalability. Sure, it is easy to plug in a few battery electric buses, but how to handle an electric infrastructure upgrade and charging operation for 100 buses or more in a depot? Gas has proven to be a scalable fuel option for transit bus operators. The questions surrounding hydrogen fueling infrastructure for transit operators worldwide, and how hydrogen fueling method works are important. Our latest white paper explains the hydrogen supply options and hydrogen fueling solutions available now in the U.S. Request your free copy here. What are your thoughts? We'd love to hear from you - leave a comment below.